Frederick Clelle Frazier, 88, passed away peacefully on May 26, 2018 in Mesa, Arizona. He was born in Ozark County, Missouri on January 3, 1930 to Fred Ragland Frazier and Alortha Pearl Morrison. He married Geraldine Naylor on December 30, 1947 in Globe, Arizona. Clelle is preceded in death by his wife, Geraldine Naylor Frazier; sister, Burnelle Nichols; and great-granddaughter, Goldie Gardner. He is survived by his children, LeElla (Michael) Gardner, Vicky (Jerry) Vaughn, and Fred (Mary Ann) Frazier; 11 grandchildren; 14 great-grandchildren; and many close friends. Frazier was a long-time Arizona watermelon farmer and horseman. At the time of his passing he was still actively training race horses. Funeral services for Clelle will be held on Saturday, June 9, 2018 at 10:00am at Bunker’s Garden Chapel, 33 North Centennial Way, Mesa, Arizona. A visitation will be available at 9:00am, prior to the services. Interment will be at the City of Mesa Cemetery located at 1212 North Center Street in Mesa, Arizona. My deepest sympathy to LeElla, Vicky, Fred and their families. I have loved Clelle for all of my life. He was a wonderful man and a good friend and cousin. May you all find comfort in knowing there is rejoicing in heaven. My 1st experience with Mr Frazier was listening in on a watermelon sales call with my father back in the spring of 1983. They 1st talked about family including my grandfather who purchased watermelons Frazier & Frazier sons. It was really something to meet him at the racetrack with my dad for he was a much bigger man in person with all the fine qualities of a man! When I addressed him it was always Mr.Fraizer ! He will be missed but his Memory will be Eternal!! God bless the entire Frazier clan!! He was a good friend and will be missed greatly. My hope is that Wayne met you at the pearly gates. God be with the family. He was our friend and our mentor. He will be missed. He was so loved at the track by many. 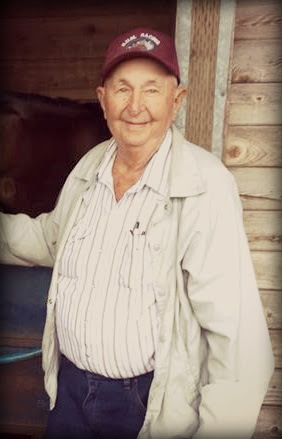 His farm was adjacent to my grandpas farm so he know my family before I even knew him. RIP Fraz. Clelle is the last of the aunts and uncles of the Ralph and Effie Naylor family. He created so many good memories for all of us. We love you, dear cousins. I cannot even imagine the celebrations in Heaven when Clelle showed up! The racket raised by all those horses nickering their welcome to him is probably only now settling . . . good ol Jake first there no doubt, right beside Geraldine and Burnelle . . . I hope they’ve all caught up on their dancing! What a wonderful, brilliant, kind, generous, fun-loving, guy and devoted husband, father and friend Clelle was! He quietly made a huge impact on both farming and horse racing in the Valley of the Sun and beyond . . . leaving a true straight trail to follow and big empty holes in the hearts of all who loved him here. Those brown eyes could sure snap and pinion you, but mostly they just twinkled with his goodness and some devilment lurking to break loose. What a legacy you left Frazier, how grateful I am that God let our paths cross way back in 1959. Clelle and Gerry gave us a home-away-from-home . . . got Daddy into the Arizona Mounted Patrol . . . no doubt they’re all dancing together now. May God’s marvelous love and amazing grace comfort you Fred, Vicky, LeElla and families . . . you are blessed to have had him for so long and it falls to you now to keep the flame! You lit up his life — now remember the good times, share his legacy, follow his example, and never let his memory grow dim! My heart and prayers are with you now — though so many miles stretch between us I love you all, and am deeply bles’t to have had Clelle’s longtime bountiful friendship! Geraldine, always. All this with lots of horse talk. I will miss him always, remember and honor him forever, and I know his happiness now lies with being reunited with his life’s love, Geri G…His love and respect for all things family was strong. Rest in peace, Heavenly Downs has a new trainer. Love you F.C.